Bear cubs are incredibly cute and cuddly, but from at least early adolescence onward all bears — from the wimpiest black bear to the largest Alaskan brown or polar bear — are unpredictably dangerous. Since bear cubs are adorable and relatively easy to raise, a large number of bears are raised in captivity. Although it's beyond the scope of this book, statistically there have been just about as many people mauled — and killed — by captive bears as in the wild. These include bears in zoos, trusted pets, and, mostly in bygone days, employed in circuses and so forth. Cubs are wonderful, but they grow up, and evidence suggests it's unwise to trust them. In researching bear incidents for this book, I came to conclusion that I needed to treat bears a bit differently than I did the African section. At least with the "Big Four" of buffalo, elephant, leopard, and lion, there are quite a few incidences of the game turning the tables on the hunter. Available evidence suggests this is very rare with bears. People get into trouble with bears, and hunters get into trouble with bears, but bear hunters almost never do. Although this pose appears menacing it actually isn't. Bears stand up on their hind legs to test the wind&apos;¦so it implies caution, because this bear knows something is amiss, and it wants to find out what's going on. Yes, sure, it happens. In the previous chapter I mentioned Jess Caswell and Ed Langlands, two experienced bear guides who were severely mauled by black bears. In both cases they were following up wounded bears — and neither bear was particularly large. I hunted with Langlands several times in the 1970s. He had been in on dozens of bears, and as he told the story, he just screwed up. He stepped from light into heavy shadow and the bear came out of nowhere and started biting and clawing. He survived, but possibly only because it wasn't a very large bear. Because of his control work Caswell, who hunted mostly with hounds, had taken hundreds of black bears. His story was much the same, except that he was able to shoot the bear again as it charged...but he failed to stop it. Afterward he decided the .30-30 he had used for years wasn't enough gun! A bear is no different from anything else: killing is not the same as stopping! Statistically there are thousands upon thousands of black bears shot annually in North America, far more than Africa's entire Dangerous Seven put together. Moreover, from Eastern Europe to western Canada, there are hundreds of brown bears shot annually. An unknown percentage is followed up when wounded. I am reasonably certain that there must be some hunters out there, somewhere, who carry the marks from a mauling that was incurred while actually hunting bears, but the incidence is so low as to almost escape detection. My friend Bruce Keller tells a harrowing story about an Arctic grizzly hunt along the northern coast of mainland Northwest Territories. They had windblown tracks of a good bear moving on the ice from one island to another, so while Bruce and his guide were looking, another Inuit guide forged ahead on his snowmobile. Keller killed a nice bear, but he and his guide were perplexed by blood on the bear's fur quite some distance from Keller's bullet hole. Although the average black bear isn't huge the black bear is at least as unpredictable as the big bears. Since its range and numbers are far the largest, the black bear causes more incidents than all the rest. A long while later, traveling east, they saw the missing guide stopped on his snowmobile. Suspecting mechanical trouble, they rolled up to a horrific sight: He had indeed found the same bear, and had been savagely mauled. His scalp was gone and his skull was crushed. One eye was completely gone, the other blinded by blood. After the bear left him for dead, how he got on his machine is a mystery, and how the rest of the party found him is a miracle. Although damaged and disfigured for life, he actually survived. It takes a lot to kill a human. Even in this instance, it's not fair to say he was bear hunting, because if he had a rifle it wasn't ready. Ah, but hunters actually injured while hunting bears? Across the vastness of Canada, Alaska, and Siberia, this has undoubtedly happened, and will happen again, but the specifics are elusive. I think there are reasons for this. Unlike the casual wilderness wanderer, the bear hunter is specifically looking for bears. That is the goal, and is not an easy goal, so he or she is (or should be) paying attention all the time and, thus, is perhaps relatively unlikely to be caught unawares by the creature being sought. Common methodology, too, favors the hunter. Brown and grizzly bears in North America are hunted by spot-and-stalk techniques, no baiting or dogs allowed. This means that bears are hunted by painstaking glassing in more open areas, or cautious still-hunting along salmon streams. It is unlikely for such a hunter to be caught unawares. In the case of brown/grizzly hunters, it is also unusual (and unwise) for a hunter to be out alone. I will never forget a moment along a salmon stream, on my first brown bear hunt in 1981. We passed a salmon freshly caught by a never-seen bear, still flopping, and at an oxbow turn we took a shortcut through dense alders. About ten yards in, guide Michael Joe "just call me Slim" Gale, in the lead, stopped and turned to me. Deadly serious, and seriously frightening, he whispered, "Take your rifle off your shoulder, put a round in your chamber, and give me some space in case we get jumped." Depending on the area, black bears are sometimes hunted in this fashion, and the same applies. Black bears, however, are often hunted over bait, and this is the most common technique for brown bears in Eastern Europe and much of Russia. One of the blinds we used in Romania was sort of a tiny (but sturdy!) cabin. "Sturdy" was comforting because there were deep scratches, claw marks, all over the wood of the blind! "Deadly serious, and seriously frightening, he whispered, 'Take your rifle off your shoulder, put a round in your chamber, and give me some space in case we get jumped.'" Black bears are more commonly hunted from tree stands, improving visibility and elevating the scent stream. Although it has never happened to me, I've talked to several hunters who have had aggressive black bears try to crawl into the tree stand with them! Hound hunting involves worrying a bear. That makes for an unhappy bear, and a bear that is not happy is a dangerous bear. At least initially, he is mostly upset with the hounds. Unlike the leopard, which seems to quickly understand that the dogs aren't his real problem, the bear seems more likely to remain fixated on the dogs. A black bear will often (but not always) tree. In North America black bears are commonly hunted with hounds, but brown/grizzly bears never are. In Sweden, where the European brown bear population is growing quickly, hounds are often used. The hunt is still safe for the hunter because, normally, the dogs occupy the bear until the hunters can close for a shot. Perhaps surprisingly, the majority of the polar bear hunting done today, at least by outsiders, is aided by dogs. Non-Inuit hunters are required by law to hunt without motorized conveyance, which means traveling by dogsled. Understand that, on the ice, usually you can see a long way. In a typical tracking situation, when the bear is sighted, a couple of dogs are released. As the chase closes, more dogs are released. They harry, harass, and distract the bear, allowing the hunters to close for the shot. However, out on the ice all protein is prey. A lot of polar bear hunts end with the bear coming into camp, hunting the hunters, yet it's still a dog hunt, and while some bears are killed coming into the tent or cabin, most of them go for the dogs, and of course the dogs alert the camp. For most bear hunters — as with most hunters of all dangerous game — there is really little danger until you hurt the bear. A wounded bear is something else again. The game changes. The quickness and viciousness — well, after all, you've hurt the bear, so it's just an animal trying to defend itself — of a smaller bear may be underestimated, but bear hunters should not and generally don't have any illusions about what a really big bear might do to them. So it makes sense to be careful...and carry enough gun. 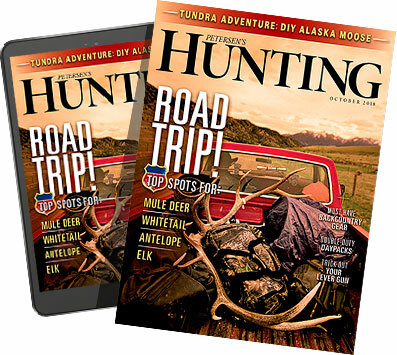 Among Alaskan guides — who, wisely, are not only allowed to carry a rifle, but are required to — the .375 H&H seems to be the normal and most popular choice. These days quite a few carry .338s because they are more versatile: A .338 with a heavy bullet will stop a bear at close range (maybe), and beyond two hundred yards it is a better choice for preventing the escape of an outbound, wounded bear. We can argue the nuances of "enough gun," but bears are very tough. As stated earlier, I think the .338 is just right for interior grizzlies because the bears are smaller and a bit of reach is sometimes needed. For big coastal bears, the .338 becomes minimal, the .375 is about right, and the .416s are perfectly suitable. Black-bear hunters have to remember that there is a big difference between the bear you will probably encounter and the bear you might encounter. I've seen black bears taken cleanly with cartridges as light as the .243, but for me the .30-06 is a sensible minimum, and in country that frequently produces big bears, it may be wise to up the ante a bit. No matter what you're carrying, it's not impossible to muff the shot. Once you wound a bear, the game changes. The forest seems more threatening, and the gun you are carrying doesn't seem big enough — whatever it is. If you've chosen wisely, it probably is. Bears are tough, and they accelerate quickly, but they still move nothing like a lion or leopard. History suggests that if you are careful and go slowly, you will probably get the bear before the bear gets you. As always, it's better to shoot straight the first time and not go through the uncertainty. Almost uniquely, in North America it appears that other hunters who are not actually hunting bears are at the greatest risk. Earlier we heard about an Alaskan deer hunter killed while apparently calling for deer. In October 2001 Timothy Hilston was attacked and killed while field dressing an elk in the Blackfoot-Clearwater area in western Montana. Interestingly, Hilston's widow sued both state and federal agencies for negligence. Since the bears are protected by the Endangered Species Act and humans are not, I suppose the negligence was in not more aggressively posting bear warnings! While I do sympathize with the family, in the 2000s the presence of grizzly bears in western Montana was not altogether unknown. This suit was dismissed, as have most wrongful death suits related to bear attacks in the wild, but a Utah family was awarded nearly two million dollars after their eleven-year-old son was taken from their tent near American Fork. In 2007 this was Utah's first documented black-bear fatality, but the specific circumstance on which the claim was based was that the bear had entered the same campground a night earlier, but no warnings were issued. Also in 2007, near Sundre, Alberta, Don Peters' body was found just a couple hundred yards from his parked truck. He wasn't hunting a bear, but apparently the grizzly that killed him was hunting him. No matter what they are hunting, hunters should be aware of their surroundings. The very act of sitting still and glassing — let alone calling(!) — can set off a predatory response. Let's not even talk about the necessary chores that follow a successful hunt: field dressing and packing out meat, activities that send irresistible smells all over the place. This is what happened to Ken Novotny, fifty-three. He and his guide were field dressing a moose when a bear rushed in from behind, killing Novotny with a single blow. As a nonresident alien and in accordance with NWT law, Novotny was not alone; he was accompanied by a licensed guide, who was uninjured. Other than these bare facts, little else has been released, but there is room for both speculation and comment. In both the Mackenzie district of NWT (Novotny) and Alberta (Peters), grizzlies are protected, with no current season. Bears are increasing in both areas, with bear-human conflicts escalating. Anecdotally, hunters in both areas tell me the bears are becoming "cheekier," less retiring and more aggressive as if they have lost their respect for humans. I cannot speculate on the actions of Novotny's guide because he has remained anonymous and, thus, could not be located for comment. I can say that, in both areas, since grizzlies are not legal quarry, it is unusual for guides to carry rifles. Note that Alaskan law requires licensed guides to be armed! I have stated that it is unwise to hunt alone in grizzly country, and perhaps downright foolish to put one's back to potential habitat and blow a deer or predator call! In bear country it is wise to establish a 360-degree perimeter, especially when field dressing game and sending irresistible smells downwind. Here's the reality, however: Field dressing a moose is a very difficult chore for one person. So, in Mr. Novotny's unfortunate case, one can postulate that the rifle was laid aside while the hard work was being done, and one of the Mackenzie district's aggressive bears caught the smell on the wind, rushed in, landed a fatal blow, thought better of it, and departed. As I keep saying, I believe strongly in bear spray, but it only has genuine utility in a face-to-face encounter. It won't do you a bit of good if you're jumped on, swatted, or bitten in the neck from behind. If a bear nails you in a purely surprise attack, all evidence suggests that the best way to survive is to play dead. You can only hope at that point the attack is territorial and defensive and not predatory. There's nothing easy about curling up and biting your lip while you're being cuffed and bitten, but that is probably the best way to survive. As I was finishing this book, daughter Brittany and I hunted in northern British Columbia with veteran outfitter Ron Fleming, a great guy and a storyteller of the highest order. He told a great bear story on himself&apos;¦and maybe it's even true. Historically few bear hunters get into trouble, but other hunting activities incur elevated risk. While packing meat in bear country it's important to keep your eyes open and avoid thick cover. Ron Fleming started guiding for Love Brothers and Lee in 1969, bought into the outfit in 1970, and he and his wife, Brenda, have wholly owned it for many years. When Brittany and I were there, we saw grizzlies almost every day, which, in my experience, is unusual for a fall hunt. But in forty-five years in the area, with innumerable encounters and several bears harvested annually, nobody has ever been hurt by a bear. This is not an abnormal record even in the best bear country because actual incidents are not common. One day Ron and a hunter hiked into a spike camp in a valley. There was a cache of supplies air-dropped in a clearing some distance from the campsite. The client was tired, so Ron left him to set up the tent. He emptied his pack and then set off up the valley to pick up a load of grub. The cache had not been disturbed, but while he was loading his pack he saw a big grizzly down by the river, close but not too close, probably a couple hundred yards away. Well, Ron figured that since the food was canned or dry, there were no dangerously enticing smells. He loaded up all the provisions he could carry and started briskly up the valley, noting that the bear was no longer in sight. He hadn't gone far before he saw the bear again...this time on the uphill side, obviously circling him. The camp, his hunter, and two rifles were still a few hundred yards away, so he wanted to run but knew he couldn't. Instead, he continued to walk casually, trying to ignore the bear. Now the bear circled ahead, and his next sighting of the bear was on the river side again. Ron knew he was being stalked, but having little other choice he continued to walk — casually, but as quickly as he could. He made a little more distance, and then heard the bear behind him. Now the bear was close, but not dangerously so. Ahead of him, at the edge of a meadow, was a stout tree that he just might make. He turned and hollered at the bear and, at the same time, also shouting to his hunter to come quickly with the rifle. The bear popped its jaws and took a few steps toward him, but by that point the tree looked a whole lot closer. Just maybe, he thought, if I drop the pack, its contents might distract the bear for a few seconds. He hollered again and the bear stopped, watching him. Then Ron turned, shrugged out of the shoulder straps, and started to make the best sprint of his life. He had only gone a couple of steps when a massive weight crashed into his legs. That and forward progress slammed him into the ground. Knowing what was coming next he closed his eyes, drew up his legs and clasped his hands behind his head in the best approved fashion. Nothing happened for long seconds. No more pain, no more sound, nothing. He waited a bit longer, then opened his eyes and looked around. The bear was gone, utterly vanished. Only then did he realize that he'd forgotten to undo the waist belt of his pack, and he'd been slammed to the ground by the heavy pack swinging down and hitting him behind the knees. Gathering up his load, he made the last little bit to his camp where he shared his story with his oblivious and incredulous hunter.